ROSWELL—Returning to Ray Manus Stadium after two weeks on the road, the Hornets had their most decisive win this year on Friday with a 59-7 win over the Woodstock Wolverines. 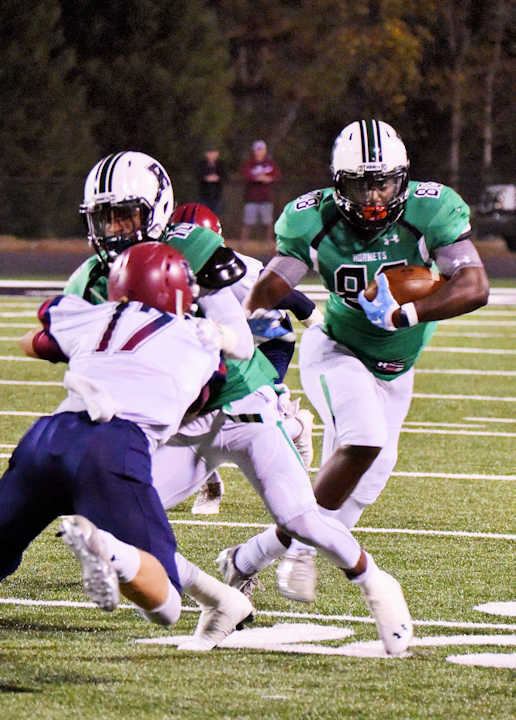 After last week’s hard-won game against Etowah, Roswell fans might have expected a tough fight against Woodstock, since the Wolverines had a much easier time defeating Etowah earlier this month. However, Roswell dominated the field from the very start. An explosive first quarter saw the Hornets score five touchdowns with 356 total yards on offense. Two more touchdowns and a field goal in the second quarter meant that by halftime the Hornets were up 52-0. Though Woodstock scored once in the second half, the Hornets were able to maintain that 52-point lead over the Wolverines by the end of the game thanks to a final late-game touchdown. The first quarter of this matchup was a show of precise execution by Roswell. Senior quarterback Malik Willis started the night off with a 64-yard keep for a touchdown in the opening seconds of the game. On the first play of the next offensive drive, senior wide receiver Jayden Comma followed up with a scoring reception, also for 64 yards. 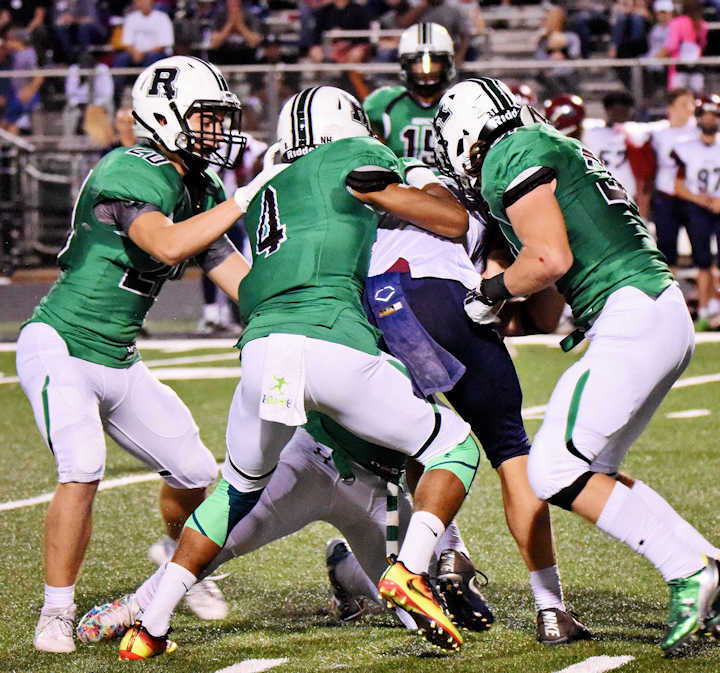 A punt that landed just shy of the endzone put Roswell in a poor field position on their third offensive series. That proved to be no match for senior running back Sheldon Evans, who ran 98 yards to the endzone on the first play of Roswell’s possession. Junior wide receiver Christian Ford led the team to its fourth touchdown with a 31-yard catch that put the team at Woodstock’s 7-yard line. Willis then capped off the drive with his second rushing touchdown on the evening to make it 28-0. After senior defensive back Xavier McKinney scooped up a fumble from the Wolverines on their next possession, senior wide receiver Kentrell Barber wrapped up the quarter with a 25-yard touchdown reception from Willis. Woodstock remained scoreless thanks to the unyielding pressure from the defense, which held the team to three-and-outs on all but one drive. In addition to McKinney’s fumble recovery, junior Cole Anderson added a sack for a loss of three yards. Willis carried for 41 yards for his third rushing touchdown to start the second quarter. 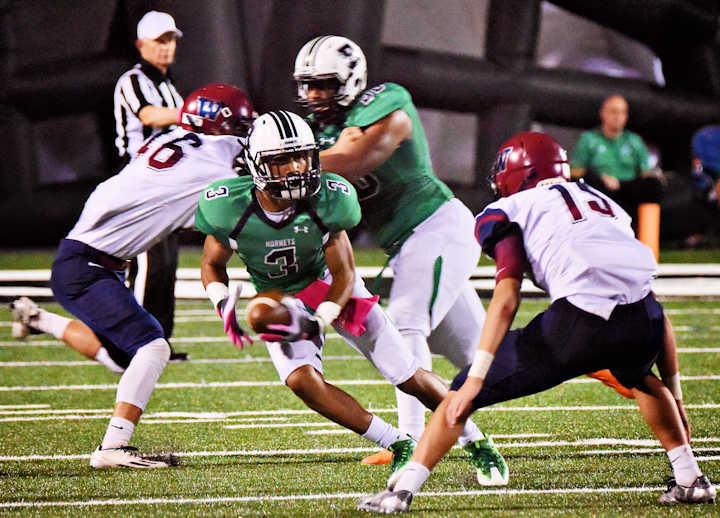 Roswell was forced to punt for the first time in the game on their next offensive series, but the defense turned in another 3-and-out followed up by junior Jordan Ford’s 17-yard punt return to the Wolverine 19-yard line. As one Ford left the field, another one came on as Christian Ford scored from 19 yards out on a reverse. senior placekicker Turner Barckhoff wrapped things up with a 42-yard field goal in the last minutes of the half. Compared to the non-stop action of the first half, the end of the game was much calmer with both Woodstock and Roswell scoring one touchdown each. 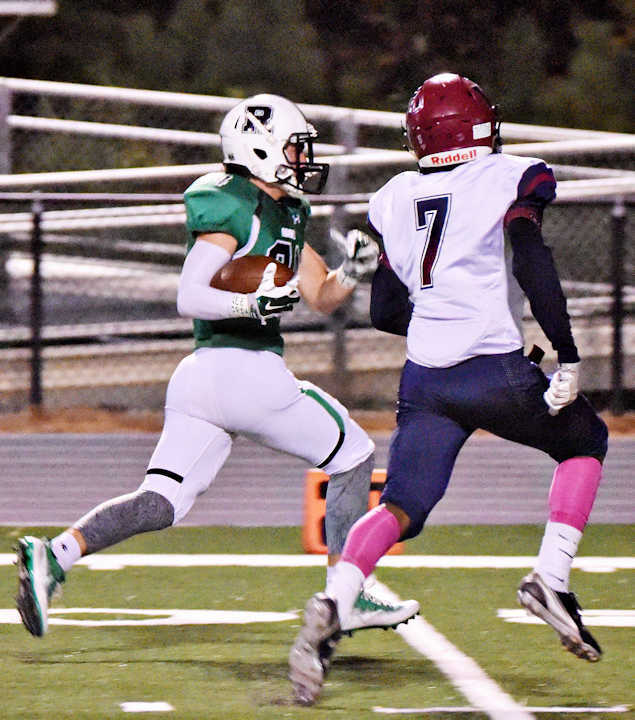 Roswell’s last touchdown of the game was thanks to junior receiver Jacob Viccari, whose 44-yard reception from junior quarterback Walt Warren brought the Hornets within a couple of yards of the endzone. Sophomore running back Jajuan White finished the drive with a 2-yard plunge into the endzone to end Roswell’s scoring for the evening. After Friday’s big win, the end of the regular season is in sight as the Hornets have just one more game to play before the playoffs begin. 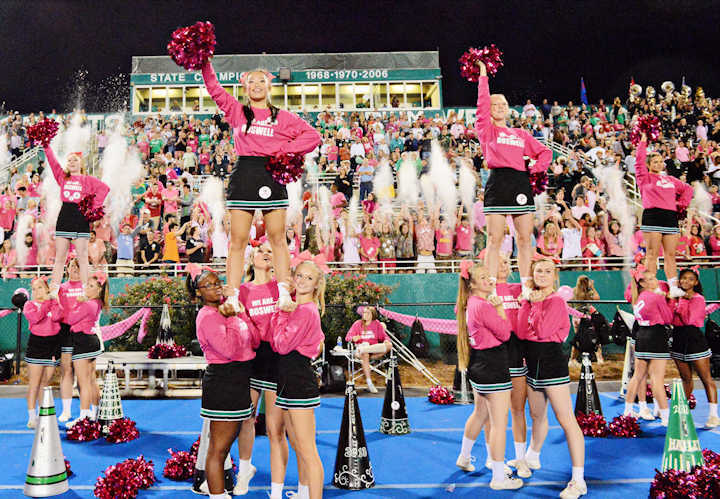 Roswell will take on the Cherokee High School Warriors on Nov. 4 in Roswell to determine the Region 4-7A champion. It is senior night at Ray Manus, so come show your support for our team leaders as they go for both their 2nd straight region crown and undefeated regular season record!